It was only four years ago when J. R. House put up a .305-19-81 season with Long Island and was chosen as the all-league catcher. 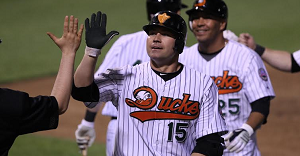 Now, the 35-year-old has been named Manager of the Year in the California League for leading Arizona prospects to a first-half divisional championship, Visalia's first in 25 years, and the team is well on the way to sweeping both halves of the split season. The Rawhide is rolling at 78-49 for the full year.